Eric Wind, Vice President of Christie’s International Watch team in New York, invited me to come to Geneva and have a look at the lots of the upcoming Omega Speedmaster 50 auction in December. I was already aware of this auction some time ago and I am (and will be) following it with great interest. Our own Speedy Tuesday got a nice little mention in the absolutely fantastic catalogue as well and the auction happens to take place on a (Speedy) Tuesday in December (15th), in New York. So I ownew to Geneva last Sunday to have a look at 20 of the 50 lots that were there. It is only a 1,5 hour flight from Amsterdam so I planned an early flight and made sure I had enough time to look around and take some photos of the lots. It was also a great opportunity to finally meet Eric Wind, who I’ve known for years, but mainly through digital channels. We pre-met through social media, you could say. So I took my Sunday Speedmaster Professional watch (a gold one), put on a suit, took my photo equipment and left to Schiphol Airport. So, I arrived early in the morning in Geneva and took the train from the airport to the city center (which is for free, coming from the airport). Christie’s had a couple of viewing days before the auction (of Monday 9th of November) in the Four Seasons hotel in Geneva. I have seen worse places and it is very close to the train station. Truth is, everything is quite close to the train station there. Christie’s was on the first floor of the beautiful Four Seasons hotel and after having my bags checked and going through the metal detector, I entered a huge room (as soon as you enter a hostess comes to you with a drink) and started to look at all the displays filled with watches. Most of the watches there were for the November 9th auction (Important Watches in Geneva) on the next day, with 362 lots (and a result of +13mio Swiss Francs including buyer’s premium). 20 Christie’s Lots and my own Speedmaster on the table. Click for a 4000×2984 image. Although that auction included a gold Speedmaster Professional Apollo XI from 1969 (fetched $22K USD), my main interest was in the display for Christie’s Omega Speedmaster 50 auction on December 15th. 20 lots were in that display and it didn’t take long before Eric Wind walked up to me and told me we should take all of them out and give them a proper examination. Christie’s Omega Speedmaster 50 auction pays tribute to the 50th anniversary of Ed White’s Space Walk in 1965, wearing a Speedmaster (105.003). The 50 watches that are being auctioned go from that very first Speedmaster 2915-1 “Broad Arrow dash one” to a couple of modern and more recent Speedmaster Professional watches (the youngest being the 2009 Apollo XI commemorative edition). There are also a couple of prototypes in this auction, but for me, one of the most special watches is the Speedmaster Professional of Apollo 17 astronaut Ron Evans. Not only does it include his Speedmaster Pro that he used on board of the Apollo 17 CSM, it also includes his gold commemorative Apollo XI 1969 numbered edition (no.1007) he received from Omega. Anyway, I want to walk you through the Speedmaster lots I’ve seen in Geneva. In reverse order. I have to warn you though, some of the images have a bit much reflections etc. as it was difficult to deal with all the spot lights despite using an origami-like light-box for taking photographs. This Omega Speedmaster Pro Apollo 13 was released in 1995 to commemorate the second most famous space mission from the Apollo program in April 1970. We did a couple of thorough write-ups on this mission as well as on this specific watch (here, here, here and here). 1995 was also the year when the movie (starring Tom Hanks) Apollo 13 hit the movie theaters, a must-see. This Speedmaster Pro Apollo 13, no. 162/999, comes with a full package and has a signed certificate and box by Apollo 13 astronaut James “Jim” Lovell. I have to note that there are more than 999 of these pieces, as Omega also did 50 Missions Cases in 1997 with 23 Speedmasters each, of which 22 models were “Mission Patch” Speedmasters. One of them was the Speedmaster Pro Apollo XIII. The same watch, but with a different (later) bracelet as 1997 was also the year of the 1498 bracelet (the original 999 pieces came on the 1479 bracelet). Christie’s estimates this watch between $5000 – $10.000 USD. Considering that this watch is very rare and even more difficult to find than the later 2003 Speedmaster Pro Snoopy Award (also to commemorate Apollo 13), I think it will be on the higher end of the estimate. Also, the complete package and signatures from Jim Lovell add value. What appears to be an ordinary Omega Speedmaster Professional is perhaps the Speedy that was in space for the longest period of time. This particular watch was on board of the MIR station for 365 days (July 1993 – July 1994). Omega sent 35 watches with the crew on board of the MIR station, 28 in stainless steel and 7 in gold (click here). This watch is no 9/28 and (probably) produced in 1993. However, it was delivered in 1995 to Italy and comes with a metal suitcase, the Moonwatch Book (Omega press) and a video tape “Omega Special MIR”. The caseback of the watch has a special engraving regarding its 365 days on board of the MIR station. Christie’s estimates this watch between $20.o00 – $30.000 USD. This 1986 – 1300 pieces only – Speedmaster Pro Moonphase is the grail Speedy for many collectors out there. There were actually 2000 pieces with this modular Moonphases movement (caliber 866) in 1986, as 700 were made in the Teutonic Speedmaster case for the German market, 400 in titanium and 300 in titanium/gold (more here). Later on, Omega made a new model of this Speedmaster Pro Moonphase watch with caliber 1866 (still in production). However, the original model has a dial without the fancy silver rings around the sub dials and comes with the highly-sought after 1980s ref.1450 bracelet. This watch is being offered on the Christie’s Omega Speedmaster 50 auction with its original box, but no papers other than the Extract of the Archives. Christie’s estimates this Speedmaster Pro Moonphase between $5000 – $8000 USD. In my opinion, a very careful estimate as these watches are difficult to find in good condition (and original dial). In 1978, Omega submitted three watches to NASA for a re-certification for the Space Shuttle mission. We described it in detail here, when we’ve found one of the actual 56 Speedmaster Pro watches that was sent to, and used by NASA. Well, this prototype was an automatic Speedmaster, using the famous and loved Lemania 5100 movement and which has this wonderful radial dial. The 38mm case was produced by the Star Watch Case factory of Michigan in the US as they need to comply with the “Buy American Act” that required that 50% of the product’s value needed to be US made. Christie’s estimates this Speedmaster Alaska III Automatic Prototype between $10.000 – $20.000 USD. I am not sure how many of these are around, but I guess only a few (one is in the museum in Bienne). One of my personal favorites of these commemorative editions, and perhaps this Christie’s Omega Speedmaster 50 auction, is this Apollo – Soyuz edition from 1976 to commemorate the Apollo – Soyuz mission in 1975. With 500 pieces only delivered to the Italian market in 1976, a super rare watch that’s hardly seen for sale (or auction). When I just started collecting I once saw one for sale (I think it was at Manbodh’s) for 10.000 Dutch Guilders (yes, that is around 4500 Euro now). They have increased so much in value and got the right appreciation over time (like many Speedmasters did and are still doing). One of the things that makes this watch cool is the Oyster-like bracelet (ref. 1168) and of course the Apollo – Soyuz symbol at 12 o’clock. This watch comes with some extras! A signed flag (owned by Apollo 17 astronaut Ron Evans, who also was back-up Command Module Pilot for Apollo – Soyuz), a signed envelope and badges. I will talk some more about Ron Evans later on. Here you can find some more in-depth information on the Speedmaster Apollo – Soyuz, as we covered it last year for Speedy Tuesday. Christie’s estimates this Omega Speedmaster Pro Apollo – Soyuz between $25.000 – $50.000 USD. I would say that it is an awesome package and a lot of collectors are craving for this specific watch. I wonder how – and why – so many prototypes can end up on the market. Like this ref.11000 Speedmaster Automatic with caliber 1045, Omega’s dubbed Lemania 5100 movement. It was produced after the Speedmaster Mark IV came out and before Omega introduced the Teutonic Mark V. So it might have been one of the try-outs for the – what we collectors like to call – the Mark 4.5. I really like this fat case and find it more beautiful than the later Speedmaster Mark V. Anyways, Omega confirmed this is a 1974 prototype and the buyer will get an Extract of the Archives stating it is one. The watch has some markings on the case and on the movement to indicate it is a pre-series (prototype) product, which was a common thing to do for them at the time, according to Christie’s. Christie’s estimates this Speedmaster Automatic Prototype ref. 11000 between $5.000 – $10.000 USD. A super rare Speedmaster Mark II in gold. Production number is very low, so I’ve heard, ranging from just a few examples to a few hundred. No one confirms. But I’d never seen one before, and I have seen quite a number of Speedmasters over the last 15 years. It weighs a ton, much heavier than the famous Apollo XI 1969 edition or the later gold Speedmaster Pro watches. The gilt dial, big hour markers with Onyx and burgundy bezel makes it look very similar in style as the Apollo XI 1969 edition. As with the regular Omega Speedmaster Mark II watches, it has caliber 861 inside. This watch was produced in 1971 and delivered to the US market. The buyer will receive an Extract of the Archives and an Omega box. Christie’s estimates this 1971 Speedmaster Mark II 145.034 in gold between $10.000 – $15.000 USD. A stunning example of a 145.022-69 with Telemetre bezel and 1039 bracelet. This 145.022, with caliber 861, stepped dial and Flight-Qualified by NASA For All Manned Space Missions case back bears the 145.022-69 reference number but was produced in 1971. Right before Omega started using the 145.022-71 cases. It was originally delivered to Zambia. My own personal 145.022-69 from ’71 has a serial number that comes very close to this one, a bit earlier though. Not a fun fact for you as it is for me though, I am aware of that. Anyway, the watches comes with Extract and no box or papers. Christie’s estimates this Speedmaster Pro 145.022-69 Telemeter between $3000 – $5000. As you probably already noticed in the header image of this article, there is also an Omega Speedmaster Racing in this Christie’s Speedmaster 50 auction. There are a couple of racing dial versions out there, the earliest being a pre-Professional with a bit more red on the dial than this one, to the recent 2004 Japan Racing edition and – if you want – the Speedmaster Pro Tintin, that was initially marketed as a racing dial as well. Having the Speedmaster Professional Racing dial for the Japanese market (2004) myself, this dial looked awfully similar at first glance (except for the large orange second chronograph hand). Only few of these racing dials were actually produced in the 1960s and 1970s and there is a lot of speculation amongst Speedmaster collectors regarding these models. However, Omega confirmed that this watch indeed left the factory as an ‘Exotic’/Racing dial configuration for the Mexico market in 1970. It comes on the flat link ref.1039 bracelet and is in very nice condition. Christie’s estimates this Speedmaster Pro 145.022-69 Racing dial between $20.000 – $30.000 USD. This reference 145.022-69 was produced in 1970 for the Swiss retailer “Meister” who – like some other retailers – had the habit of putting their name on the dial as well. This is quite rare and sought-after by collectors. However, that’s not the only thing about this particular watch. It also has the bezel with the little ‘mistake’ on it: the tachymeter scale says “220” where it should have said “200”. These bezels are currently quite sought after (they went up in price quite steep since last year or so) by collectors. However, this watch was originally delivered like this, no “put-together” as we unfortunately see a lot (driving up prices in a nasty way). Christie’s estimate for this Speedmaster Professional “Meister” with “220” tachymeter scale is between $6000 – $10000 USD. The watch comes with an Extract and time correct Omega box. If you are a regular visitor of our Speedy Tuesday installments (since 2012! ), you’ve probably seen our Speedmaster Professional 145.022 Buyer’s Guides that we published recently. In part two, I mention the tropical dials explicitly and explain why these dials have turned into a brown color. Well, this 145.022-69 is a very nice example of a Speedmaster with a tropical dial. It is a bit hard to get the color right on the photos, but I hope you are able to see the brown color. If not, look at the contrast between the bezel and the dial and you’ll see. For the rest, this is your pretty regular 145.022-69 Moonwatch actually, but the dial makes it special. The watch comes with the famous blue Mooncrater print Omega box and an Extract. Christie’s estimate on the Speedmaster Pro 145.022-69 Tropical is between $3000 – $5000 USD. You don’t need to be a genius to guess that this won’t be a problem. It is one of my favorite Omega Speedmaster Pro watches ever made and the fact that it belonged to Apollo 17 astronaut Ron Evans makes it even cooler. Ron Evans was a back-up crew member for Apollo 7 and 11 as well as a back-up Command Module Pilot for Apollo 14 and Apollo – Soyuz (see above). However, his only flight was the last scheduled Apollo 17 mission together with Cernan and Schmitt. Unfortunately astronaut Ron Evans passed away on a young age (56) in 1990. He left NASA in 1976 but had a role and involvement in NASA’s Space Shuttle program nevertheless. This watch was given to him for his services as support crew for Apollo 13. Since the first gold commemorative Speedmaster Pro Apollo XI were presented in Houston on November 25th 1969, the astronauts that worked on missions later than that (Apollo 14 to 17) received their watches in 1972 and 1973 and were numbered 1001 to 1008. So this is no. 1007 and given to Ron Evans. The watch comes with a letter of Ron Evans widow, Jan Evens, declaring that this watch has been in the family ever since 1972 and the original relief Moonrock box. I’ve talked about this watch so often here, that I suggest you click here, here, here (Mattingly’s Speedmaster) or here (Schirra’s Speedmaster) to read more about it. On the photo, the dial appears to have a bit of a “white haze” (if that makes sense). I think it is the crystal that causes this, but if I would be the buyer I wouldn’t touch it. There are two other BA145.022 (the official reference number) watches in this Christie’s Speedmaster 50 auction, but only this lot is the astronaut edition, the other watches (lot 21 and 14, not in this article) was delivered to the market for regular sale. Christie’s estimate on this Speedmaster Professional BA145.022 Apollo XI commemorative edition in gold is between $40.000 – $80.000 USD. Apollo 17 astronaut Ron Evans engraved his Speedmaster himself after the mission. From what we officially know, is that during the Apollo missions, the only watches used by astronauts were the Omega Speedmaster Pro reference 105.012 and 145.012 watches with caliber 321 (column-wheel) movements. The Speedmaster Professional 145.022 wasn’t used until it “won” the tender for the Space Shuttle missions in 1978. Officially that is. It remains to be a grey area somehow. 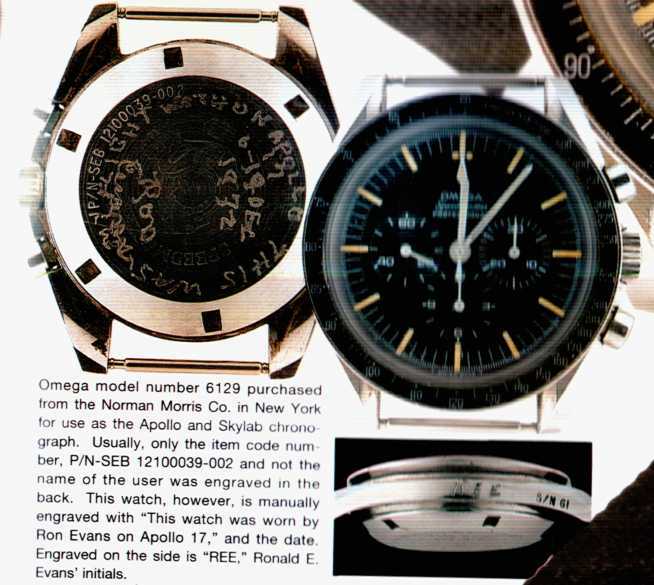 The Christie’s Omega Speedmaster 50 auction catalog states that Ron Evans used this Speedmaster Professional on board. The watch comes with a letter from Jan Evans that the watch and the strap were used by Ron Evans during the Apollo 17 mission. The watch does not have the official SEB and NASA serial number (for internal use) like we’ve seen on later NASA Space Shuttle mission watches (the 56 pieces they received from Omega, mentioned earlier on in this article). The original 145.012/105.012 (see an image of that watch here) from Evans that he used during EVA is currently at the Kansas Cosmosphere, Hutchinson (according to his list). The velcro strap with SEB number that was used for that watch, comes with this 145.022. As you can see, Ron Evans engraved the piece himself stating that it was using during the Apollo 17 mission in the CSM and during the Heat Flow experiment he did on board. So this watch was in space, during the Apollo 17 mission. The recent auction of the Bulova (we did a Q&A with Apollo 15 astronaut Dave Scott on that watch, click here) fetched a whopping 1.6mio USD including buyer’s premium. This was something I heard a couple of times in Geneva while visiting the Christie’s viewing and discussing it with other Speedmaster collectors and enthusiasts: Will this Speedmaster go just as crazy? Personally, I don’t think so. It has not been on the Moon (in space yes, but so has the MIR 365 model that I discussed above, although the Apollo missions do have some more mystic and “romance” to them.) and that will probably keep out a lot of the space item collectors. This 145.022 comes with a later ref.1450/808 bracelet (also used on the Moonphase models from 1985/1986 and the Holy Grail Speedmaster Automatic with caliber 1045. The watch was not used on a strap or bracelet on board of the CSM, it was attached to brackets. Christie’s estimate on this flown Speedmaster Pro 145.022-69 from Ron Evans is on request. I know their estimate, but also heard some estimates from fellow collectors and there was quite a gap (much higher by the collectors’). It is very difficult to do an estimate, I agree and so I won’t. But it not be as high as the recent Bulova sale, I am convinced. That Bulova sale by the way, is quite sketchy in my personal opinion. Bulova coming out with a re-edition of that watch (500$ quartz version everyone wants to have it seems) two weeks after the sale. My guess is that Bulova bought it themselves and blew there marketing budget on it for the new piece. Anyway, let’s see where this goes in December! The Apollo 17 flown watch comes with the letters from Mrs Jan Evans, Extract, used AG-7 Fisher space pen, used Velcro strap (as described) and some black metal piece that was used during the heat experiment (it was glued to the watch apparently). A very cool package for the ultimate Moonwatch collector, for sure. Part two of the Christie’s Speedmaster 50 Auction preview can be found here. More information on the Christie’s Omega Speedmaster 50 sale can be found here. Unfortunately I will be unable to attend the auction in New York (a tad bit expensive to fly there for this occasion only), but if you are able to, I’d suggest you do.